Trupanion is a pet insurance provider that was founded in 1999 in Canada. The company expanded to the United States in 2005, where it was the very first pet insurance provider that did its own underwriting. They also provide education to pet owners about the vet and pet care industries through the NAPHIA. In 2008, Trupanion was awarded the first ever AAHA Seal of Acceptance by a pet insurance company. With so many prestigious and groundbreaking merits to their name, it’s easy to see why Trupanion’s emergency medical coverage is so trusted by pet owners. Trupanion offers similar emergency medical services coverage to many other popular pet insurance providers. They do not offer a wellness protection plan, meaning that any standard vet visits for annual shots or checkups cannot be claimed. However, what they do offer is excellent coverage for illnesses, injuries, and accidents, as well as pregnancy and alternative therapy coverage with certain policies. Unlike many other pet insurers, Trupanion imposes no limits on their coverage at all. Most pet insurance companies offer the ability to choose your own copay and deductible; however, Trupanion’s deductible options are truly one of the best we’ve seen. Pet owners can choose to pay no deductible at all, which may result in higher premiums, or they can pay up to $1,000 in deductibles, to keep monthly premiums very low. If your monthly budget is tight, but you can afford to keep a small nest egg aside to cover the higher deductible, then this option could help you save big bucks on your overall coverage should a major medical emergency ever arise. Trupanion’s plans are not quite as customizable as other companies; rather than allowing you to purchase exactly what you need a la carte, you can choose one of three basic plans, and then add on additional coverage as necessary. This includes an option for working pets, such as rescue dogs, breeding dogs, service animals, etc. They also offer specific coverage for mobility devices in the event that a pet becomes disabled. 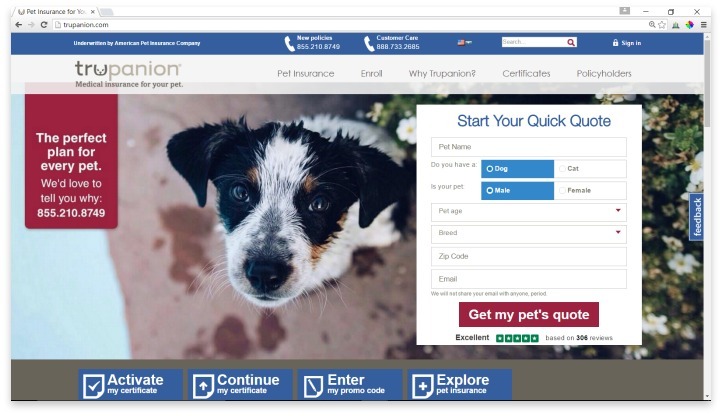 Beyond their lack of wellness coverage, one of the major downsides to Trupanion is that they offer no discounts at all, not even to pet owners who insure more than one pet. Prices cannot be seen without entering personal information, however, so it’s still a good idea to give Trupanion a look – you may find that their prices are lower than other options even without the extra discounts. Trupanion offers excellent coverage for illnesses, injuries, and accidents, as well as pregnancy and alternative therapy coverage with many deductible options. Overall, Trupanion falls somewhere in the middle of the pet insurance companies we’ve reviewed. They have great coverage options, and are very specific with the types of additional add-ons they provide. Their deductible and copay system are very useful for fitting pet insurance into any budget. However, the lack of discounts for multiple pets, and the fact that it’s harder to customize an exact plan without paying more for add-ons make it hard to believe that their services will be the most affordable you can find. At the end of the day, you may find that another service offers exactly the coverage that you need at a more affordable price. While Trupanion is certainly a solid choice, there are other pet insurance companies out there that go above and beyond what Trupanion offers. Have you had an experience with this company? Please share your Trupanion reviews below.